Left: A star designed from scratch. Instead of using one of the star designs from the template design this student (who is a Y4 student designing for the first time) created a star design using the 'pencil' tool. The font message on the design says '8 Xmas' in reference to the age of the creator. He had assistance to create the hole for the hanging of the design from the tree. Although the design could have been refined he was extremely happy with the result. Print time to complete the project two hours. Left: The student also peer modelled with a Y1 student (a five year old student). The student was eager to repeat the process and personalize the decorations for herself, which is shown in the photograph to the left. It was printed with a 'gold' PLA which was using the regular default settings on this site - a 20% infill for the print, using a 8mm nozzle to increase the print time at the sacrifice of the detail for the print. This design had slightly more depth to it than the one above and given the breif and plan there is no intention to reprint at this stage. Left: Student completing the task choose to approach it by using a square block as the basis for the design. The student then selected a basic font for the naming, used two simple illustrations for the base of the design and inserted into the top of the design a easy access way to hang the decoration. The design shape was a 90mm square that was 5mm thick and had the lettering sunk 5mm into the base the design, this was preferable from having it on top as it produced much more definition and sharpness. A four hour print. Left: Produced at the same time although independently, and therefore not really influencing each other came this design. The font used is the same as above, and the basic layout and the objects that have been added likewise. The print time is also very similar, although the two students were adamant that they were not working in collaboration or influencing each other, not that this would have been an issue or a bad thing. Four hour print time. Challenge: To produce a reading stand to allow a student to focus on thier reading. Background: The student is a special needs student who needs to focus on reading without being distracted by other things happening in the classroom. The task was to produce a reading stand that would allow the student to have the book tilted and held in the reading position, meaning that the student was more focussed on their reading. The idea was to build a prototype and then start to look at developing the idea further to develop a personalised reading stand for the student. The success of the angle of the stand was/is crucial and is easily attained by using a 3D Printer to produce it. With a speed of the printer the heated filament sets before the nozzle repeats the pass - thus allowing the creation of a solid shape and structure to meet the design idea - in this case the angle (as we've mentioned before with Tinkercad there is a design aspect of the main interface that allows you to create any angle of your choice). One of the complicating factors was the size of the books that students were reading. This student is reading early level journals (reading for five and six year olds) so the journals are thin and limited in size - hence the smaller design of the stand. Level of Difficulty: This is a work in process. Once the design has been refined we will post additional details as it develops. The project when it is completed will feature a complicated design tailored for the individual student to best meet their needs. This is the basic design so its easy, however when completed it is anticipated that the level of difficutly would be catergorised as 'hard'. Timeframe: Ten hours - this is simply a first attempt at the process and the timeframe will be increased relative to the design. This is a first attempt at an ongoing process. Size: This design is measuring 140mm across the front, 100mm to the back and the top end of the design was 100mm long and a further 140mm across. The angle is a 45 degree angle. What would we do differently/next steps for students: This design is the start of a process. The design needed to be larger. The base was stable but would have benefitted from being thicker that would have given it more weight. Both those aspects of the design will be addressed in future. Challenge: Student, while ten years old has proven to be extremely skilled at producing some exemplar quality prints. The student wanted to ensure that a iPad stand was created that would be significant that was produced before the end of the year. the problem and allowed the balance that the student was looking for. The student also wanted to personalize the iPad stand with combination colours. The name block at the front was a straight forward addition, with a butterfly on the reverse. The 'butterfly' has been used in prints before - the rafting that was created with it was deliberately left in place to maximize the stability of the print. The mainstay of the designs were from the Tinkercad interface. The student concerned with this project is ten years old - however they have been responsible for a series of highly innovative and creative prints. Above: Butterfly design on rear. Level of Difficulty: High - as far as iPad stand designs go, this really is the most impressive one creative by a student and as such this would not be for the faint hearted. The student has literally produced an exemplar that we will be using to show others as a top of the line design. Everything works in relation to each other - and the one challenge that needed to be overcome the student was able to identify and solve effectively. Time frame: Like the level of difficulty, this was not for everyone, the stand took twenty five hours, and in addition to this the lettering and the block took a further three hours, for a total of twenty eight hours for this project. The thickness of the heart part of the storage could have been reduced slightly which would have affected the time slightly, but given the dimensions (see below) this is a significant project that would require a significant investment of time. Size: The design measures 200mm across, with the stand measuring 130mm and the storage at the end a further 70mm. The design including both the lettering and the butterfly measured 160mm. The block at the back of the design measures 100mm high, the storage is 70mm and 90mm respectively. The balance block was 20mm by 30mm by 20mm. What would we do differently/next steps for students: Initially the lack of balance due to the overhang from the iPad stand proved to be problematic, however the student herself identified the solution easily. There isn't much more to add to what has already been written, this is a print of the highest order that really is an exemplar. Left: A smaller scale Christmas Tree featuring a basic design (created by students with the shape) and a small addition of a star above the name. The design measures 70mm in height and was 5mm thick and 50mm wide. Part of the last letter of the name, the 'y' was absent as it was designed to close to the edge of the tree. The circular hole at the top of the tree conceivably could have been made smaller but this design was by a younger student who hadn't had much opportunity with a 3D Printer. Print time 45 minutes on standard settings. Left: Created by a Y1 student, with assistance, this basic design featured in the shape of a heart with the students name and a 'horse' shape, as the student who designed it has an interest in the animals. The star shown on the right hand side on the top of the picture is actually not attatched to the main design, it subsequently came off, as it was rafted onto the design, not on the base. This is a minor adjustment that was going to be completed with a small adjustment. 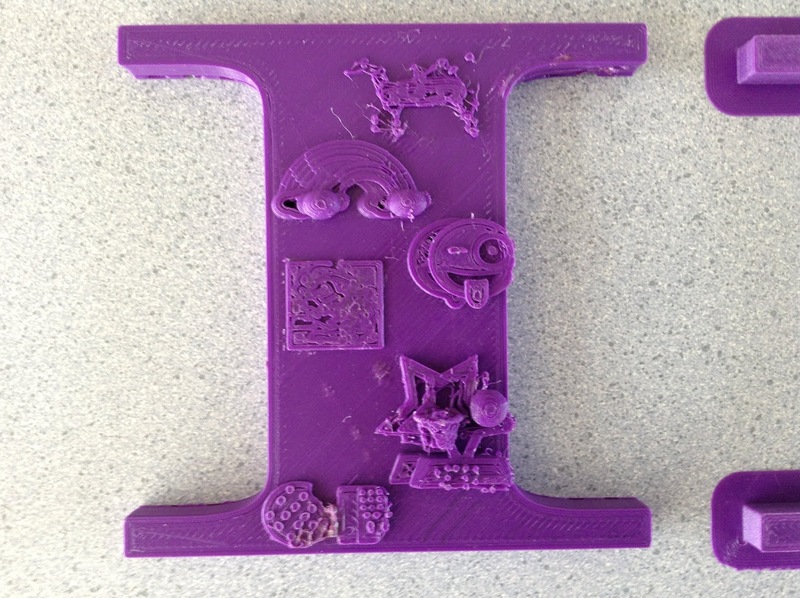 Tinkercad allowed this student with assistance (who is Five) from a ten year old student to complete the design. This was a two hour print which was 100mm across and 80mm high. The designed met the brief and the student was extremely pleased. Left: A basic star design created by a student who was receiving tutition from a ten year old and creating a design for the first time. The student concerned wanted a star to sit on a specific location so she insisted that it did not have a hole in it to hang it from a tree. The lettering was designed to dominate - and this photo was taken prior to the filament clean up that is required when a print is finished. The design was 5mm thick and took three hours to print, with measurements of 120mm across and 70mm high. With the exception of the mounting aspect of the print it met all the requirements that were expected. This print is not being redesigned. Left: Another Christmas present themed design to meet the criteria that was expected. The name of the student was raised only 3mm from the base of the design which accounts for the slight lack of definition - and again this is prior to spending anytime to clean up the print and some of the plastic that appears to be present on the design will be removed with a small screwdriver or pair of pliers. This design was heavily influenced by the 'present design' from earlier in the print run (who is the student who is also responsible for the Sleigh Design. This design measured 100mm cross was 90mm high and 5mm thick. The hole at the top is for the hanging, in hindsight the student could have perhaps used the ribbon from the top of the design. Print time three hours. Left: A more advanced design in the series. The student built this design from scratch, creating a 'Santa' design from basic shapes and including some interesting design features, such as featuring her name on the belt of the figure and printing the arms seperatly. The arms were then super-glued onto the design in the place where the student wanted them (its the same arm design twice, so the character doesn't have two thumbs!). The student is slightly older than most of the classroom students, being eleven. Potentially more details could have been created for the figure (the feet etc). Design measured 80mm across and 120mm high, and was 5mm thick. This took four hours including all of the parts. This design may seem familiar, that is because it was featured on this blog with different lettering and was produced during a powercut. This powercut stopped the printer when it was nearly completed (two and a half hours into a three hour print) and only the lettering remained to be completed. 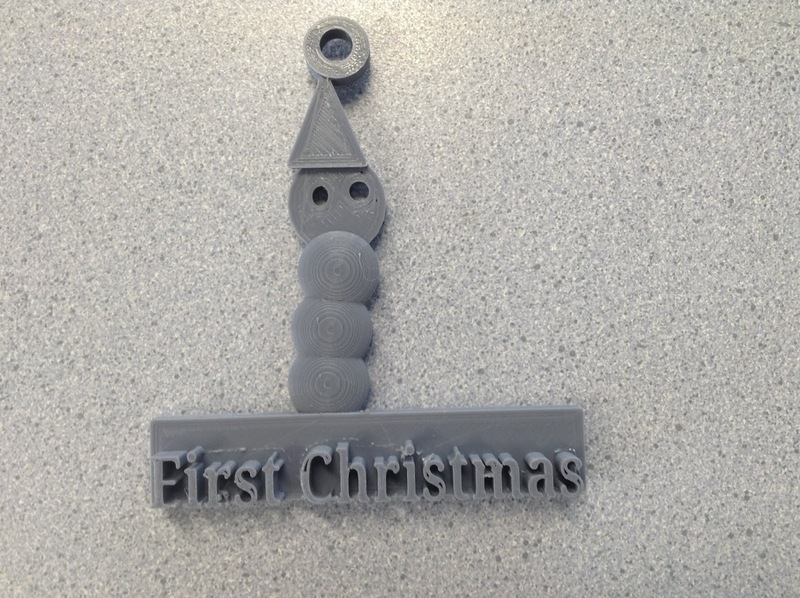 The student by then had completed the 'First Christmas' printing and instead of repeating this created the 'Santa' lettering and a backing plate to fit it onto and then super glued it into place. This did not affect any of the dimensions or details of the print as previously described. Left: Another 'Christmas Tree' themed design from the series. Design was almost identical to the others featured in this series. The student wanted to include several 'fun' features on the tree, as evidenced by the sun glasses and the moustache. Student the included their own nickname on the base of the tree (student insisted on having a lower case 'p' for the start of her name) The hole again is probably a bit bigger than was required but the student (who is ten years old) was extremely pleased with the result and was able to produce a significant piece of work that met all the criteria. The design was 100mm high and 70mm across at the base, it was 5mm thick and the print time took three hours. Challenge: As with others in this series to produce a class set of classroom decorations themed for Christmas, we're running one classroom printer non-stop to complete this over the period of four weeks. This student has shown creativity and invention when creating 3D Projects, for this, she wanted to create from scratch a sleigh for a Christmas Decoration. Background: Student has been working on 3D Printing projects for two years as part of the classroom program. She has been consistently creating inventive designs that have shown flair and creativity. This was a situation when she had a brief, had seen other projects in the series but wanted to put her own spin on the creation. This was designed with help from her younger brother who is eight years old. 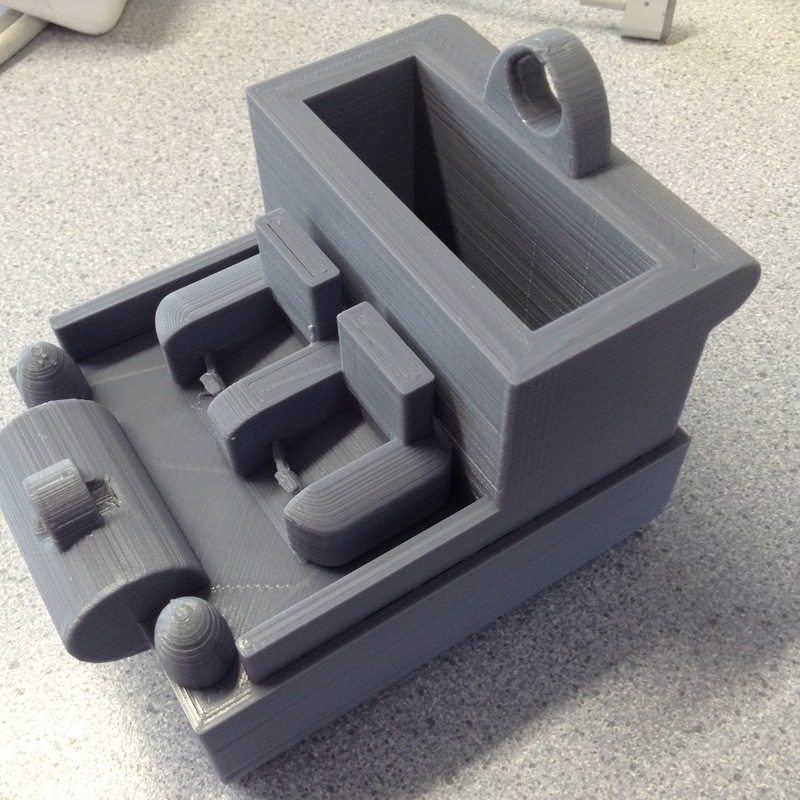 Level of Difficulty: High - this sort of design isn't for the faint hearted however she used the basic Tinkercad Interface to create all aspects of the print - with the exception of the seats and seatbelts which she sourced from material that was free and online. All of the design, measurement and creation was original created by the student. Timeframe: Ten hours for the print. This print consisted of no 'rafting' what-so-ever, so there was no wasted filament. Given the dimensions and the purpose this is the perfect design in the sequence. Size: The front of the print measured 110mm across, was 75mm deep and 80mm high at the back and 40mm high at the front. The individual aspects of the print varied slightly depending on the location. What we would do differently/next steps for students: This was one of the the best prints in this design of runs, the design was particularly complicated and worked extremely well. The student(s) involved in the print were thrilled with the result and this was one of the best examples from a student during this year. Challenge: For student to produce a unique and personalised 3D Printed design that could be suitable as a festive ornament to hang (from a tree). Background: As part of the challenge of having an entire classroom of 30 students produce a 3D Print before the festive season, and then buddy with another student from another classroom this student designed to create a 'first Christmas' themed decoration relating to the fact that she had a sibling born who was celebrating just that. The student had been influenced by another design in this series but choose to create something herself from scratch. 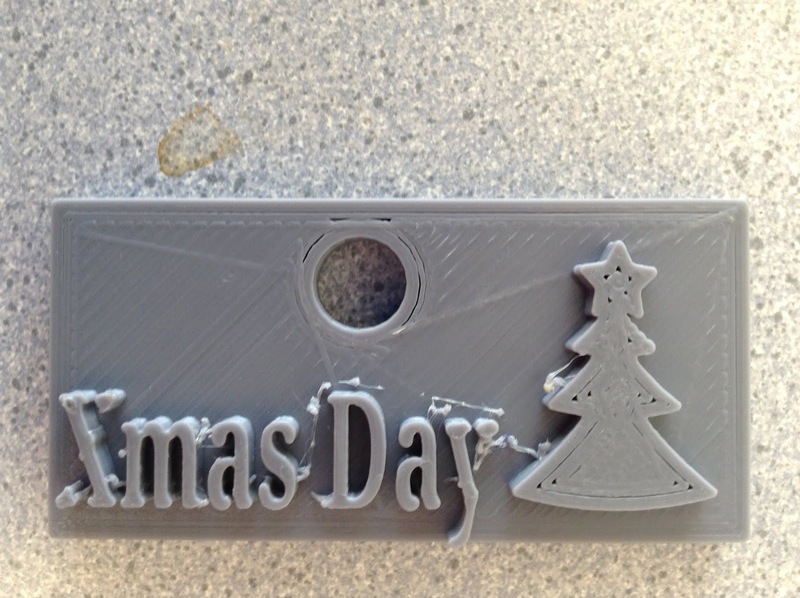 She decided to go with the creation of a 'Father Christmas' figure, made from using some of the primary shapes available on Tinkercad to create the shape, used a circle, which then had dropped a hole into it to meet the hanging requirement and finally personalised it by adding the message in a clear basic font at the front of the design. The student who created this was a Y5 student and this essentially was her first design independently. Level of Difficulty: Low - however this particular design works well in conjunction with the sum of its part. The student was wanted the print to be robust and work and purposefully did not add too much detail to the print. Timeframe: Two and half hours - the size was kept to a minimum so the time was reasonable. Size: The design measured 100mm across the front, the front section featuring the 'First Christmas' message was 5mm thick, 20mm long. The santa design was a further 95mm high and 20mm across. What we would do differently/next steps for students: Nil - the student was extremely excited by the project and pleased with the end result, and vowed not to change anything - it was commented to her that the 'Father Christmas' looked a little like a 'Christmas Worm' however she laughed this off. 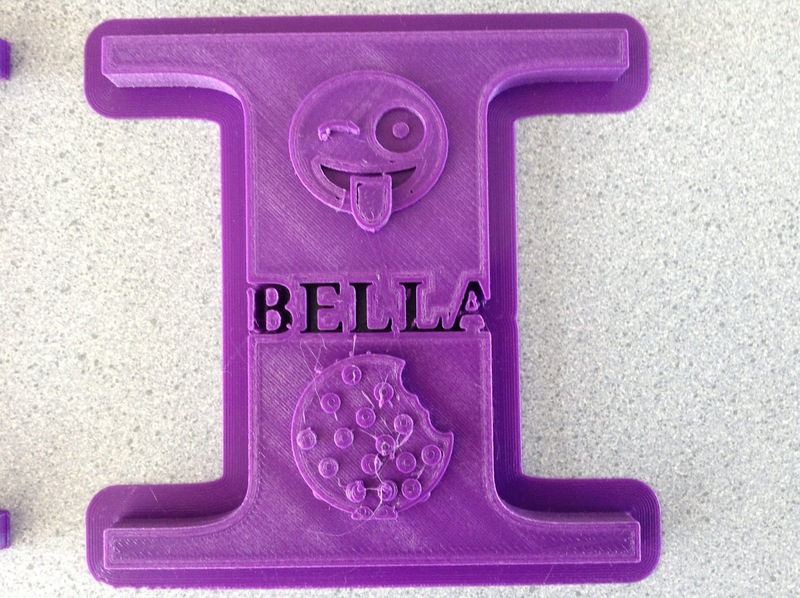 Challenge: Student wanted to design a gift for another student themed around her name. The student designed and completed this project, however on reflection it needed considerable revision to be completed to a standard that the student was happy with. Background: This student who is ten years old has shown creativity and flair with her 3D Printing design. Her intial design that is shown left was somewhat cluttered, featuring a number of additions to the base of the design. This caused the printer a little difficulty to create so much detail in such a relatively small place, as a result a lot of the design look too crowded and the student who the print was intended for (Isabella) didn't have the obvious connection between her print and name. This was discussed with the student who went to redesign the print considerably. The new design replaced the clutter of the original and focussed on having the name of the student featured on the design. This featured two of the original additions to the first print but both were centred in the middle of the design, without additional clutter around them. The 'name' part of the design, which was originally completly absent was now inserted into the middle of the design. Level of Difficutly: Medium - this design is relatively straight forward but it took a discussion with the student to acknowledge the details created by the printer to get to the final result. Sometimes projects located online that require a lot of detail are best suited by using a smaller nozzle, but our preference (which is using a 3D Printer within a classroom containing nearly thirty students) is to use the largest nozzle that is possible for the speed of the prints that are produced (yes we could constantly switch back between both but we tend to allow the students to manage as much of the process as possible and not at the level yet of changing the hardware over, although they do change filament). Timeframe: This print took six hours to complete, with the regular settings that are used on this site. Purple happened to be the colour that was loaded into the machine rather than a specific colour choice and this in term happened to be a positive accident with the finished product. Size: The top of the design is 130mm across, 60mm across in the middle and 130mm high. The print has a height of 10mm. Given the intention of the print, its design relative to this size, and the display potential of this there wouldn't be much reduction that would be possible in the size. What we would do differently/next steps for students: The design as it stands dosen't have any capacity for it to be fixed to a wall or hung. The students creation with the lettering into the base of the design meant that the 'rafiting' or backing hasn't been removed. This is because the internal parts of the 'b' and the 'a' would be removed when the rafting taking away, affecting the design, ideally the end of the 'a' would also have been moved in slightly from the edge of the design as it is missing its end. Challenge: As part of the 3D Print Christmas Design Challenge, students who had created or produced a first run print, that needed refinement, were redesigning and reproducing the print with improvements to meet the outcome that we were seeking. Background: We're attempting to complete thirty classroom prints of original 'Christmas' themed designed decorations from our class (thirty students) and then a further thirty other students from throughout the school. In the design shown left in the original version the student wanted the penalization in the form of the nickname 'Horsey'. In the first print shown left, the 'Horsey' was raised on the base of the print, however with the size of the lettering being small (10mm in height) the name did not appear to be recognizable. The student subsequently redesigned this, introducing 'Horsey' to the base and sinking it into the design, which made it clearly visible. Otherwise with the exception of some minor readjustments the design was completed, with the small addition of a heart to hang the design. Left: The smallest design in this sequence. The idea behind this was to produce something simple but effective. The print time for this label was one hour, making it a 'classic' short term print. However the student has been given the task of personalizing it as at present it is extremely generic. This design measures 40mm high by 80mm long and is 5mm thick. Left: This design was created by a seven year old. The basic premise was the same for the rest of the process and design, however the student placed the hanging hole too close to the point of the star at the top, creating a gap in the star, the name of the student in the middle of the star was not large enough and too ill defined. The student concerned was thrilled with the result, but a simple matter will be to reproduce this and simply make it larger this will allow the name to be defined and the star points to have the hole centred. A positive experience for the student and a forty minute print time at present, which means the results were relatively quick. Left: Another basic 'star' design to start with including the addition of the lettering message of penalization. The design measures 90mm across but the amount of filament has been minimized with a thickness of 5mm and just under a two hour print time. The size of the hole to attach to the tree on reflection is probably too large, however it still fulfills the purpose, no additional changes will be made as the task has been successfully completed. Left: Using a square base design this student opted to include a Christmas Tree on the left of the design, the initials of the person that it was gifted too in the centre and three stars. Two were raised up the third was sunk through the design creating the gap in the print. A 5mm thickness was used to reduce printing time, and the lettering and stars were raised 5mm from the base. This print came in and two and a half hours. Left: A snowman. This print encountered some issues. The hat design, where the hole for attaching the print to the tree failed, it was too large and this caused the hat itself to implode (which was subsequently removed as it was not solid). The base of the hat rim remained as this could be used to attach it to the tree. The name of the student who created it was sunk into the bottom of the design, this failed due to the lettering chosen being too small and the name 'Georgia' too long. With a 5mm thickness and a three hour print time with a 80mm height and 50mm across. Student very happy but if required to meet objectives then a considerable redesign is required. Left: Basic Tree design - two hours, with a name focused at the bottom, a basic star at the top with the hole for the attachment placed there. 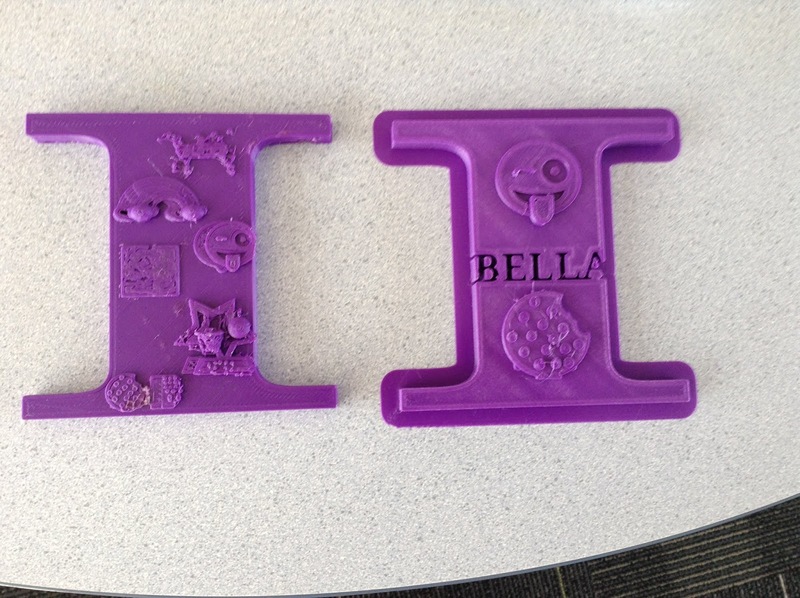 This was the first print for an adult who was supported in her creation by having one of the other students create and teach her the design basics, which she mastered in three to five minutes. No adjustments would be made moving forward. 5mm thick, with the lettering rising a further 5mm and a height of 100mm and a width of 50mm. Very similar to the design shown right. The posts in this series followed a first set of prints, detailed below and inspired by the 'Christmas Tree' Print from two days ago. Since then we have expanded the project to target producing thirty individual prints (for the students in our classroom) and a further thirty prints for a buddy, another student from elsewhere in the classroom. Left - Further development of the 'Snowman' idea. This print shown is prior to the removal of excessive PLA filament. The student attempted to personalise this by adding the names of her family members on the body of the snowman and placing a soccerball in the middle. The print has excessive PLA printing on the back, due to its 3D Design (this is going to be detailed in a further, separate print). This is a 100mm high, 60mm across snowman, which is 10mm deep. It has a four hour print time which could be significantly reduced. This print will be reconfigured to remove the cluster of names and lettering on the base of the design. Left: An original Christmas Tree design, featuring the initials of the student that designed it with their initials featuring prominently in the design. An attempt was made to have a star at the top of the tree, this was not successful as removal of the rafting also resulted in teh removal of the star. The student was a nine year old making their first attempt at 3D Printing. The tree was 80mm high and 60mm acoss at the base. The design was only 4mm thick which was reflected in the print time of just under two hours. This is a good basic design for junior students or students who are attempt to print for the first time. Left: A snowman inspired design. The lettering on the base of the Snowman reflected the name of the family that the siblings are part of. Due to the length of this name and the space available with the Chirstmas message there was considerable issue with the font that was printed. To remedy this in the re-design the student is going to increase the size of the base and experiment with the lettering. The design is currently 100mm high, 70mm across and 5mm thick. Two hours to print. This design will require reworking relative to the size of the design and the size of the lettering and would be described as medium difficulty. 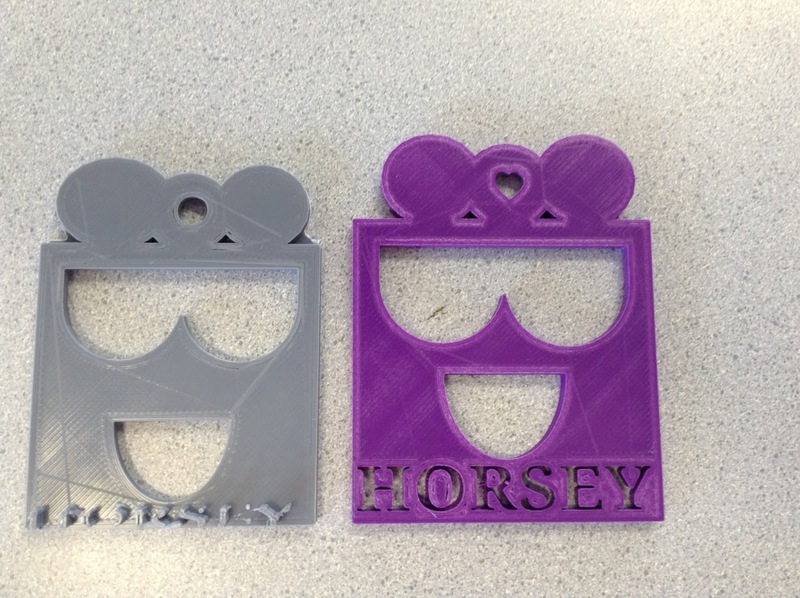 Left: Designed by a learning support adult in the classroom, these two designs were essentially the same design twice. In the design the names were prominent and featured a simple star as additional decoration. The designs were created using Tinkercad and printed with the standart defaults (8mm nozzle/20% infill) on our Ultimaker 2+ Machines. Two hours to print both decorations, these are not requiring an revision or redesign as task is completed. Challenge/Background: This task involved in the students in my classroom producing an original Christmas themed decoration, intended for hanging on the Christmas Tree and then the students concerned locating another student, in another room, who could be from Five years old to Twelve years old and repeating the process. Left: One of the first design in this process - features a "hi" instead of a personalised name of the student who created the print, or the person that it was intended as a gift for. It was 10mm thick with the 'snow-man' design. This was accessed from the main Tinkercad Interface. Design time - ten minutes, heigh, 120mm and betwen 50mm and 100mm across. The only remaing taks was for the student to insert a hole into the hat of the snowman so it could easily be tied to a branch. Three hour print time on default settings. Left: A design that needed to be reworked - the original plan for this was to create a face by leaving out features of the design, although this was not clear from the shape that resulted. There was a word built into the base of the design that was suppossed to read 'Horsey' but because of the size of this it didn't print out to a level that it could be clearly read. Two hour print time on default settings - print was 5mm thick. Left - Essentially the same design as shown above, althought this one featured the name of its creator sunk into the design itself, right through to the other side. The only other aspect of the design was the hole to hang it. Designed in under three minutes, 80mm across, 70mm high and 5mm thick. Designed with Tinkercad and printed with default print settings. Left: Designed by a eight year old with a present design with additional stars, this design was 5mm thick and measured 140mm by 130mm. It took six hours to print using regular Ultimaker 2+ Default settings. This was the students concerned first experience with 3D Printing and their first project. Left: Using a Christmas Tree as a base, with this student adding additional designs to the base (sunglasses, a moustache, a bow). The student has produced a considerable number of high quality projects so this was designed in minimal time. 50mm across at the base and 120mm high. This design took three hours to print with a width of 5mm. Left: A straight forward design at first glance but for affect the student choose to drop the Christmas Tree's into the base of the design and add thier name. An addition was then added to the top of the design so it could be hanged. Design was 90mm across and took two and a half hours to print. Designed in Tinkercad by a ten year old student. Challenge: For students to design a suitable 'Christmas' themed decoration that could hang on a Christmas Tree. 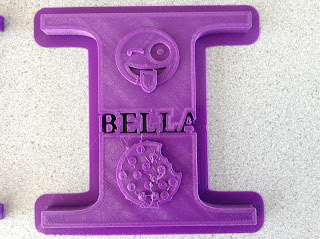 Design needed to be personalized and for a challenge for the teacher the student was to design one themselves, and then choose another student in the school (at any level from five years old to twelve years old) and instruct them to use Tinkercad and produce an ornament as well. Following this process it would allow to produce sixty Christmas ornament across the school. Background: As above - we were looking at trying to have students in large numbers complete original prints that were personalized. 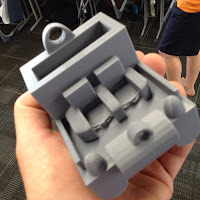 The students in my classroom tend to be able to produce particularly high level of 3D Prints as shown on this blog, however at times this can be daunting for other (teachers and students) so allowing our students to instruct or show others how to create items using the 3D Printer. Although not all of Christmas is celebrated the same around the world, or of course at all, depending on the culture, however it would be easy to modify this for different holidays. We tried this last year, but left the print running until too close to Christmas. We also were trying to look at using Glow-In-the-Dark filament and this at the time was proving to be problematic (which over time we've become to understand that it most likely resulted from the temperature settings for the printer (which was too high, by default) and also not sealing the PLA in an airtight container after it was first opened. Ultimately we wanted to ensure that we could complete a mass set of printing (in this case we are tar getting sixty unique and personalized decorations) on a single printer over a two to three week time frame. The prints in this series are going to be based around my classroom of students (Y5/6 so nine and ten year olds) but also then developing with students between five and twelve. We're going to show this examples in a Google Slide, with each example and keep adding to the slide as the prints develop. Level of Difficulty: Low Medium - Tinkercad has a large multitude of templates available including several holiday themed prints - generally these have been used by the students to start the design of the print (an example is the Christmas Tree shown above). In this case the student simply added a hole to allow the ornament to be strung and created text that personalized a message for the ornament. Time frame: Six hours for this print on the usual default settings - the lettering in particular was a little raised, which could have led to an adjustment in print time, although given its size, not too much. Size: The print was particularly large for a Christmas themed ornament. It measure 100mm across more or less at the base and had a height of 140mm. Crucial to the print was the thickness of the print, which was deliberately left at 5mm. The lettering visible raised it another 5mm. What we would do differently/next steps for students: Grey happened to be the next cab off the rank so to speak in terms of PLA perhaps a different type could have been chosen for a different affect. The design is due to be used to inspire others and will be a large-ish scale print run of around sixty different designs. This will be the first.